I switched to Post Office yesterday for BB+line rental+ eve/w/e calls and so far I am very pleased. The whole process was painless, with good communication from Post Office all the way. The router was preconfigured so was a doddle to set up. And now I can get 5-6 Mbps all the time (my line max is 8). I was with AOL previously, whose service had got so bad I was only getting 0.2-0.3 Mbps most of the time. The Post Office section of this forum is fairly inactive - I can only take that as a good thing. Good luck getting customer service in future if you ever need it. I have had the same experience. Good speeds and helpful UK customer service at half the price. Like all ISP's they are not perfect. While the phone side of customer service is helpful and knowledgeable, they often don't reply to an Email enquiry. Also their mail server goes on the blink at times. People are quick to blame an ISP for things that are very often nothing to do with them. For instance, I was recently getting the hump over slowing speeds needing a router restart. It turned out to be a problem with a firmware upgrade on my Draytek router that even Draytek and their beta firmware failed to cure. Thanks to common sense and a trawl of the web, a firmware downgrade sorted the problem. There are those that may say that a lack of activity here shows a low number of PO users, but a Which survey has shown them to be happier customers than many including those of BT, Sky, Virgin and TalkTalk. Do you mean you have much less contention? If so, I'm interested because I first synced at 8 and, with Freedom to Surf, downloaded at 6-7 and never experienced significant contention: my download speed was pretty constant right through the day. Then F2S was taken over by Tiscali and is now part of TT. Now, early in the morning, just now, I got 5.7 down but I can guarantee by afternoon/evening, my download will have dropped to 1 or below. I'll be interested in your reply and comments from anyone else who can recommend a low contention ISP. I agree - no ISP is perfect and I agree the mail server is a little bit temperamental at time. But the service is incomparable to my previous ISP, and the tech support number (0845) is free at any time if you have their phone package as well. yes that is what I mean. On POst Office I get a steady 6Mbps all the time on LAN, and about 3.6 on wi-fi. There's no drop at peak times. The same thing happened to AOL - first taken over by Tiscali, then Talk Talk. The service got worse and worse and god help you if you try and contact customer services. Post Office wasn't my first choice - but I had limited options in my area. But I have been happy with the service so far. And I think lack of activity on this forum is a good thing. Working with the public - when they are satisfied you don't hear anything, but when they are unhappy you certainly do! I've been with PO for over a year now, and the only time I needed their Customer Service they not only gave me the right advice first time; but the following day my IP Profile was upped. 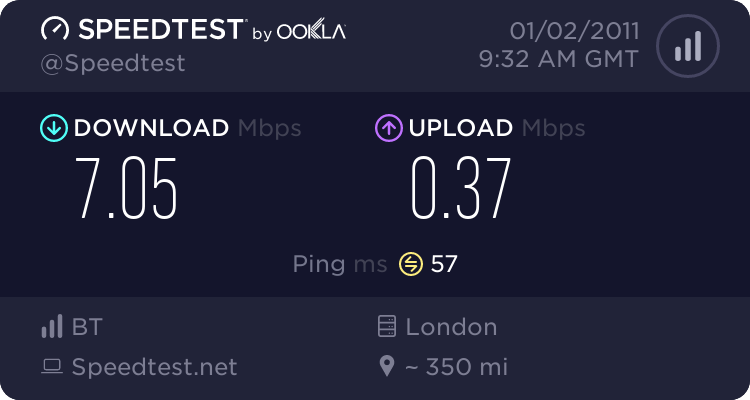 I am currently running at 2.5Mb, despite BT assurances that my line will only support 1Mb, and a total lack of effort by Zen (my previous ISP) to get it above 1Mb, when it was obvious from the stats that it was possible.